An excellent (newly framed in oak) panel of six tiles designed by CFA Voysey for the Pilkington Tile & Pottery Co; c1900. From the Fish & Leaf design series; in the dark green colourway. 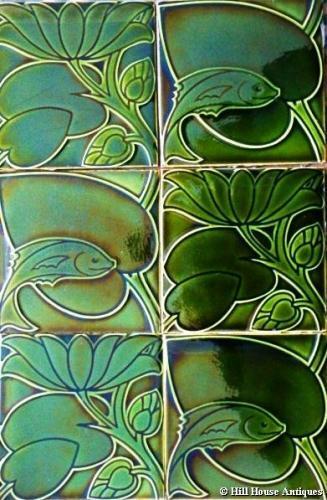 Several of Voysey’s tile designs for Pilkington’s were shown at the 1901 Glasgow Exhibition, including this Fish & Leaf series. Voysey’s designs for them were also illustrated in The Studio. Ref: Pilkington’s Royal Lancastrian Pottery and Tiles by AJ Cross, p26 pl 19.